Audio Video Live (AVL), a Calif.-based integration firm, deployed a VUE al-8 line array system for the HBO January 27 broadcast of its HBO Boxing After Dark event. AVL chose the VUE al-8 line array system because of its size-to-performance ratio, the integrator says. The company’s criteria for use in the Los Angeles Forum arena required a balance of intelligibility, directionality and sound pressure level (SPL) capabilities. 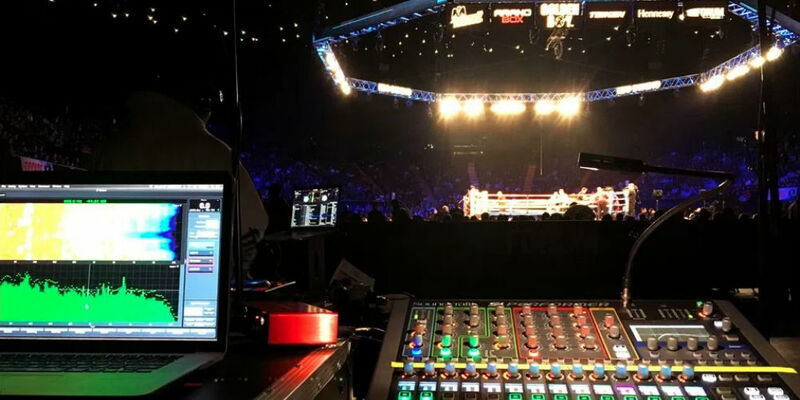 “Based on our experience of doing in-arena sound for boxing, I can hands-down say that the VUE system is the ideal fit for HBO Boxing,” boasts Dennis Layton, owner, Audio Video Live. The company needed a system that could playback high SPLs of DJ entertainment, as well as spoken word from the ring announcer. Supporting the boxing show’s audio needs, AVL installed a VUE system that included 32 medium-format al-8 elements in four hangs of eight, with a total eight al-8SB flyable subwoofers set on top of the hangs to augment the speakers’ low-frequency reproduction. Through the use of the al-8s the hangs totaled 15 feet in length to provide enough room to work with the venue’s 30-foot clearance from the top of the lighting truss to the venue ceiling. Rounding out the system, AVL employed VUEDrive system engines to power the speakers and to manage its processing needs. AVL also used SystemVUE for iOS for real-time monitoring and control during the show. “There’s a simple reason why AVL continues to invest in the VUE line … particularly the al-Class,” adds Layton.